Novak Djokovic does not consider himself among the favourites at next month’s Wimbledon and shares the popular view that defending champion Roger Federer is likely to win a record ninth trophy at the All England Club. The Serbian, who is making a comeback from a long-term elbow injury, claimed his first victory over a top-10 opponent since last May at Queen’s Club on Thursday as he thrashed Grigor Dimitrov to reach the quarter-finals. The 12-times grand slam champion won the most recent of his three Wimbledon titles in 2015 and believes it is too soon to think about a fourth trophy at the elite tournament. “Let’s not get too ahead of ourselves too early. 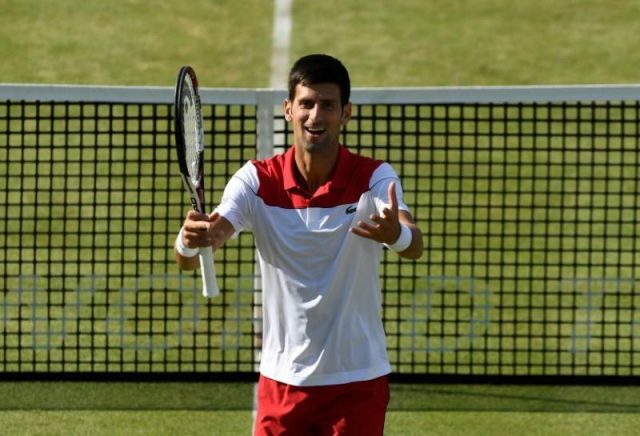 I’m definitely not one of the favourites for Wimbledon,” Djokovic told British media. World number two Nadal, who last won the Wimbledon title in 2010, will enter All England Club without any competitive matches on grass this year after the Spaniard withdrew from the Fever-Tree Championships. Djokovic also backed two-time Wimbledon champion Andy Murray, who returned from a year-long injury layoff at Queen’s Club but fell to a hard-fought defeat by Australian Nick Kyrgios, to make an impact. “Andy (Murray) and myself if we play well (can be contenders). We dropped in the rankings, but Andy played really well against Nick Kyrgios here,” Djokovic added.